GUDC is positioned to facilitate urban development by assisting state government and existing agencies in formulation of policy, institutional capacity building and project implementation, and to assist in the funding and implementation of projects. Assist state government in preparation of policy and strategy for urban development infrastructure provision. Assist state government in preparation of guidelines for private sector participation in urban development. Maintain an updated information database on urban development. Assess the need and form of Government Guarantee to ULBs required for raising funds from the market. Assist the state government in formulation, appraisal, implementation and monitoring of urban projects funded from multilateral sources. GUDC would facilitate sustainable development of urban areas, both new and existing, in order to achieve high living standards and growth of economic activities. GUDC would seek to undertake its activities on a self-sustaining basis. It would balance its development-oriented roles and activities with its commercially lucrative activities. GUDC would actively seek partnership with the private sector, govt. agencies and educational institutions in order to accomplish its roles and support the existing urban institutions. 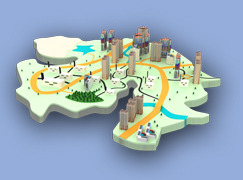 GUDC would seek to be a proactive body in understanding the trends, needs and interventions required in the field of urban development for provision of sufficient and high quality urban areas and urban infrastructure either directly or by strengthening other entities responsible for the same.